A harbinger of what the up-and-coming Buena Vista area is aiming to be, Palat is a neighborhood restaurant with polished service and a sophisticated menu of modern Italian dishes. Chef Pippo Lamberti opened the restaurant with his father Aldo Lamberti, one of southern New Jersey and Philadelphia’s most prolific restaurateurs. Palat Miami is his eighth restaurant but his first in South Florida. The handsome 85-seat dining room is full of interesting touches like floor-to-ceiling glass windows that slide open for an al fresco dining experience and a handcrafted chef’s table made of French pine wood. The menu is comprised of contemporary Italian-inspired small plates, charcuterie, pastas and tapas. The pineapple tartare is a refreshing mix of diced pineapple and celery for a light starter. Crostinis get topped with eggplant and truffle cheese or peas, bacon, ricotta and mint. Pastas are made in house and include the sea urchin with squid-ink pasta and crabmeat, house-made beet ravioli, and charred octopus with artichoke and rosemary pesto. Squid ink pasta with crabmeat. For bigger appetites, there’s a hanger steak and a New York strip with romesco sauce, which comes in two sizes, a branzino with zucchini sofrito and a snapper with orgenata. Desserts include a Nutella crepe and pannacotta with tropical fruits. An upscale spot in Sunny Isles specializing in modern Italian cooking, this glossy dining room belies its humble strip mall location. Owner Gonzalo Carnevalli named the restaurant for the quaint township in the northern Italian region of Piedmont and positioned chef Jorge Cabrera (formerly of Seaspice and Sugarcane Raw Bar & Grill) in the kitchen. Bar bites are ambitious with platters of short rib pastrami with pickled mustard seeds, red cabbage puree and bread crumble, foie gras toast with raspberry marmalade, fresh strawberries and pistachios. Golden fried green tomatoes with a pomodoro gorgonzola sauce keep company with house cocktails. The dinner menu spans pastas, salads and larger mains. Highlights from the pasta list include squid ink pasta with rucola and lobster and ravioli with pear and creamy gorgonzola. Pizzas can be had topped with a variety of gourmet toppings such as smoked salmon, prosciutto and porcini mushrooms. Foie gras toast at Biella. Fish specialties include the Spigola (sea bass) with carrot puree and black lentils and the Branzino with mussels, clams, shrimp and cherry tomatoes. For meat lovers, options include the Costolette di Agnello — Colorado lamb chops with red lentil puree and the Pastrami Brisket with bone marrow, and arugula. Save room for dessert, which can be vanilla pannacotta with passion fruit caramel, whipped crème fraiche, an ever-changing list of sorbets and Apple Torejas with cinnamon ice cream and caramelized apples. The Gates Hotel, the Art Deco gem on Collins that was formerly an Aloft hotel, has a new restaurant in the former Continental space, and it’s a modern spin on the traditional tacqueria. Executive chef Nicolas Bour comes with quite a pedigree — in addition to having competed recently on Food Network’s “Beat Bobby Flay,” he’s cooked for two United States presidents and the entire Kentucky Derby — and infuses the menu with creative tweaks to Mexican-inspired cuisine. There’s also a bar featuring more than 100 tequilas and mezcals and eager mixologists willing to blend custom concoctions based on flavor preferences. 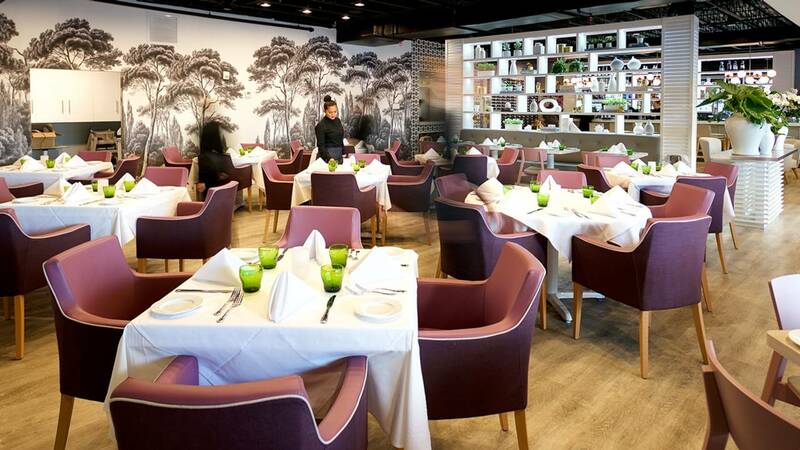 The glass-enclosed dining room offers plenty of mid-century charm and there’s an inviting outdoor patio nicely shielded from Collins Ave traffic. Tacos and chips at Agaveros Cantina. Start off with a chunky guacamole served with chips then move on to tapas-style plates of Chipotle chicken skewers accompanied by cucumber avocado and red onion salad. The elote grilled corn is served farm-style with the stalks still attached and slathered with jalapeno mayo and cojita cheese. Tacos can be had with fried fish, portobello mushrooms or “al carbon” with grilled skirt steak, cabbage slaw and chimichurri. Desserts of bread pudding, banana split and Mexican bunuelos, fried tortilla triangles dusted with sugar and cinamon, are a fitting coda to the Mexican feast. The courtyard at Call Me Gaby. Restaurateurs Anthony and Kathy Guitera have opened possibly one of the most charming spots in South Beach. 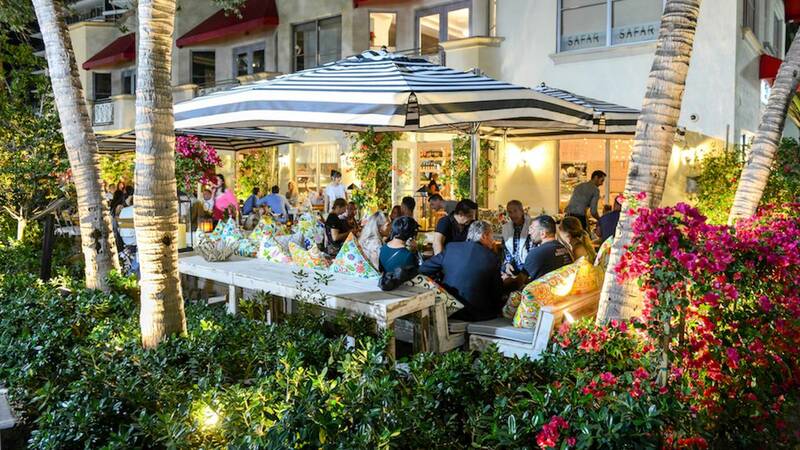 The restaurant features an Instagram-perfect outdoor courtyard in SoFi with outdoor couches festooned with colorful cushions, distressed wood furniture and black and white striped umbrellas giving it all an Italian villa feel. Pizzas at Call Me Gaby. The brick oven is the star of the kitchen, giving focaccia bread flecked with rosemary and pizzas with gourmet toppings their trademark char. The concise menu features salads like the roasted baby beets with goat cheese, orange segments and crushed hazelnuts to the kale salad with pine nuts, blue cheese and raisin dressing. Pastas include a gnocchi with gorgonzola and papardelle Bolognese. But you’re here for the pizzas and there are over a dozen to choose from including a classic Margherita to the Maria, topped with black truffle carpaccio, and the Angela, made with smoked salmon, avocado and dill. The dough-based confection continue for dessert where Nutella pizza shares space with Gabriella, fried dough balls dusted in powdered sugar and served with honey whipped ricotta.